The Honda Civic is one of the best known cars in North America. Styling may not set it apart from many cars, but its reputation for fuel efficiency, durability, and reliability have helped it stand out from most cars on the market today. It is also a favorite for tuners, backyard and professional alike. There are hundreds of Honda Civic parts that you can choose from to customize your car, but here are three that offer performance in several ways. In a previous post, lowering kits were covered. They are great for additional handling and a faster take off by reducing squat on acceleration, but are limited when standing alone. Try adding a carbon fiber hood as well. These hoods offer a 50 lb weight reduction, which offers a faster 0-60 and a little extra at the top end. Seibon is probably the best known manufacturer, but Carbon Creations, and VIS Racing offer solid products as well. There are other weight reduction options, but a carbon fiber hood is an easy project for do-it-yourselfers at any level. While you are looking at a carbon hood, why not look into a replacement hatch or trunk lid for additional weight reduction? This project is a little more involved and doesn’t really add anything other than a cool factor. 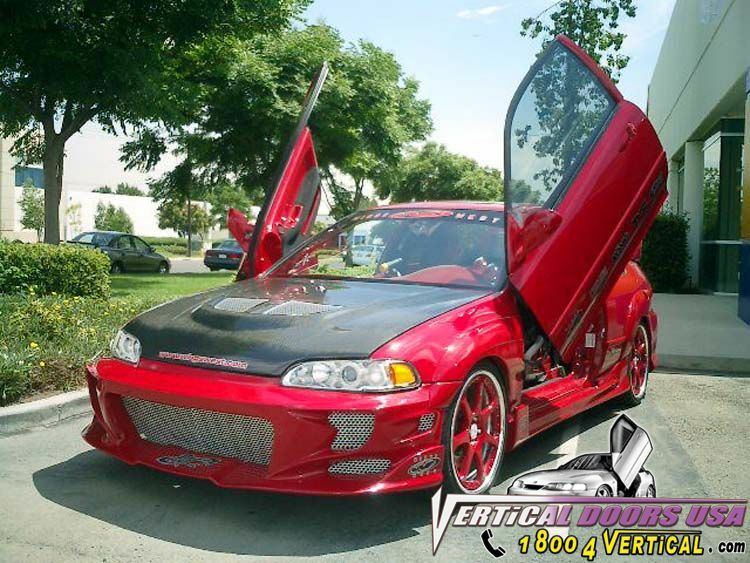 Vertical doors for you Honda Civic will really help your ride stand out in a crowd. There can be some welding involved, but the basic parts are all included in the kit. Hey, if a Lambo can have them, why not your Honda Civic? The next project should be designed to reduce the aerodynamic drag of your Honda Civic. Body kits are in order. Spoilers, replacement grilles, under bumper spoilers, the list goes on. Lowering the drag your car experiences can add top speed and offer improved handling. If you make all of the changes mentioned in this post, you could see an additional 50 horsepower from your car, a shorter time in the quarter, and a faster mile. Additionally, your handling will improve, allowing you to perform better in slalom type events or just weaving through traffic. Good luck with your projects.